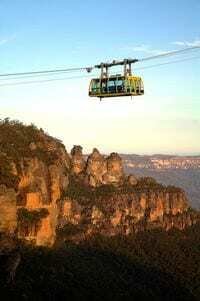 Scenic World A must see for Blue Mountains visitors! 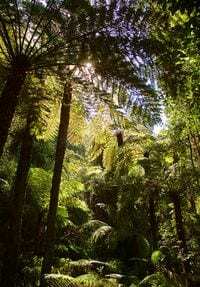 The new “Scenic World” is now open! Just a short few minutes drive away from the 3 Explorers Motel. Scenic World is renowned for providing the ultimate Blue Mountains Adventure – from native birds and fresh air, to breathtaking views of the World Heritage-listed region including the Three Sisters, Katoomba Falls & Jamison Valley. Open every day of the year, 9am-5pm. Discover the thrill of a 52 degree incline riding the steepest passenger railway in the world, the Scenic Railway. 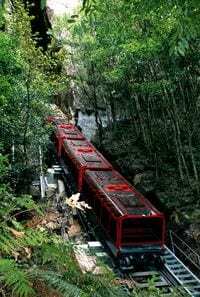 A whole new visitor experience awaits, with glass-roofed red carriages offering expansive views of the rainforest setting and spectacular Jamison Valley. Custom designed carriages allow passengers to choose their own adventure like never before, adjusting their seated position up to 20 degrees! Choose an adventurous ‘Cliffhanger’ ride at a steep 64 degree incline, or for those seeking a relaxed journey select the ‘Laid Back’ option. Of course, loyal fans can still ride the ‘Original’ at 52 degrees. Discover the tranquility of ancient rainforest – or simply tire the kids out – strolling along our 2.4 kilometre Scenic Walkway. Brilliant in sunshine and even better in the rain, this elevated boardwalk immerses visitors in Jurassic rainforest on the Jamison Valley floor with minimal impact on the environment. Along the way, explore elements of the site’s coal mining history including the mine entrance, a replica miners’ hut and scale bronze sculpture of a miner and his pit pony. Learn about local flora, listen for the native lyre bird or taste pure Blue Mountains water straight from Marrangaroo Spring. Enjoy a peaceful moment in the open-air Rainforest Room, or on rest benches located along the route. Options for various walks taking ten minutes or a full hour are clearly signposted. Glide between cliff tops and gaze at the rainforest canopy through the glass floor of the Scenic Skyway! Suspended 270 metres above ancient ravines, the Skyway provides a unique thrill as breathtaking views are revealed beneath your feet through the electro-glass cabin floor. For the less adventurous, seating and solid flooring is also available! With 360° views, the 720 metre journey provides the best views of Katoomba Falls, the Three Sisters, and Jamison Valley stretching to the horizon. Disembark at the Skyway’s east station to access lookouts over the valley along with bush trails to Echo Point.